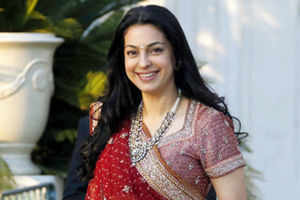 Bollywood beautiful smiling face & film actress Juhi Chawla will work with Hollywood producer-director Steven Spielberg for the upcoming film ‘The Hundred Foot Journey’. The film will be directed by Lasse Hallstrom and produced by Steven Spielberg, Oprah Winfrey and Juliet Blake. It is an acceptance of a novel written by Richard C Morais, which narrates the story an Indian copulate who tries to settlement in a small village in France. The couple set up an Indian restaurant antonym to a French restaurant, which sparks a culinary warfare. Juhi said she initially defied adopting the film, but the big names came with it accepting Spielberg, Oprah and Lasse changed her mind. “When my son Arjun who’s only 10, heard that I was doing a Hollywood film, he asked me if I was working with DreamWorks Studios. Wow, I didn’t even know he knew about DreamWorks!” she said. The film is slated to release in August 2014 and will also boast Helen Mirren, Om Puri, Charlotte Lebon and Amit Shah.